Murder is Everywhere: Two Takes on Leighton. Today, I’m honored to share my slot with Tim Hallinan. Each of us misses Leighton very much, and our words were very tough to come by, but we wanted to express how we felt about our much loved, irreplaceable colleague and friend, and so here goes…. Leighton Gage was an example and a friend to me, both as a writer and as a person. It's terrible that he's gone. If there's any comfort, it's that, in a way, writers die differently than most other people. 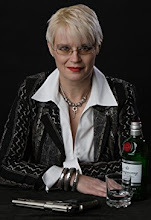 Writing novels is the marathon of the creative arts. It demands whatever you originally meant to bring to it, and much, much more than you expected. No one who has written more than, say, two or three novels can believe realistically that he or she isn't revealed, good and bad alike in those books. Leighton is all over his splendid, unique novels. His decency, his fairness, his compassion, his outrage at injustice—especially toward the helpless and downtrodden—come through on every page. His warmth and his loyalty are there, too. Leighton—the person who wrote those books—is still there, on the pages he crafted. He'll always be there. I'm at a period in my life when I've lost a growing number of people. Losing Leighton was like a knife in the heart. But at least with Leighton, I've got the part of him that's captured in his wonderful books: not just an image, like a snapshot, but a heart and a soul. So goodbye, Leighton. I'll keep you with me. It’s how I’ve felt only a few times before. When my brother died I remember most vividly. He died way too young. He was seventy-one in years but forever young in spirit and drive. Always bursting with ideas and plans, yet never for a moment forgetting what mattered most: his beloved wife Eide, children and grandchildren. A reviewer had kindly compared my writing to Leighton’s so I took it as a sign that this was the place to be. Thank you, fate. Leighton came across as the captivating, articulate, erudite speaker so many others have described and one thing more: a hell of a nice guy, or as they say in (parts of) Miami, a real mensch. As soon as his panel ended I made a beeline toward Leighton on the podium but a fan speaking Portuguese beat me there. I patiently waited until they concluded their conversation and then stepped forward to introduce myself. Before I could say a word Leighton stood and began apologizing, saying he had to hurry off to the book signing room and suggested we speak there. The next words out of Leighton’s mouth put him forever at the top of my all-time good guys list. You could have knocked me over with a feather from one of those rare Brazilian birds he so often described in his MIE posts. He sat back down and proceeded to tell me in detail how much he’d loved the book when he read it as a judge for the Edgars’ best first novel award (there seems to be a common thread here among some MIEers :)). When he asked about the reception it had received from the locals on Mykonos I said, “They haven’t lynched me yet, but I’m ever on the lookout for torches and pitchforks.” We laughed and exchanged stories until someone from the signing room came in to drag him away. We promised to email each other. In February 2010 Leighton asked if I’d like to do a guest appearance on his pride and joy, Murder is Everywhere. I jumped at the chance. A few months later, in the summer of 2010, my girlfriend and I were in Rome while Leighton was there and we met for drinks and dinner with some of his friends. It was a true My Dinner with Andre experience, and by the end of the evening we felt as if we’d known each other forever. In the Fall of 2010, Leighton said that he and his five MIE author mates would like me to come on board as the seventh member of the crew. Once more he’d wowed me. But it came at a price, for he expected me to pull my weight each and every week. As much as he believed in tirelessly promoting one’s work—something he always pushed me to do more of—MIE was not part of that formula. Leighton and the other creators of MIE (Cara Black, Tim Hallinan, Michael Stanley (Michael Sears and Stanley Trollip), Yrsa Sigurdardottir, and Dan Waddell) did so in common cause to offer readers literate, interesting details of the venues inspiring their work devoid of self-promotion (except on new book launches). The extraordinary success of the site is a tribute to that vision as exemplified by Leighton’s relentless pursuit of excellence in all of his posts. 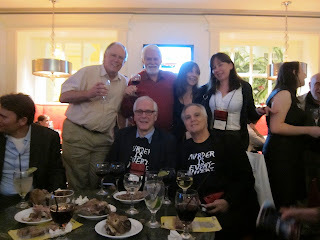 At the last gathering of the MIE crew with Leighton (in St. Louis at Bouchercon 2011), we all had great fun, none more so than our time together in the hotel bar sharing Yrsa’s smuggled sheep’s head with him and Eide. In the bar with the sheep. 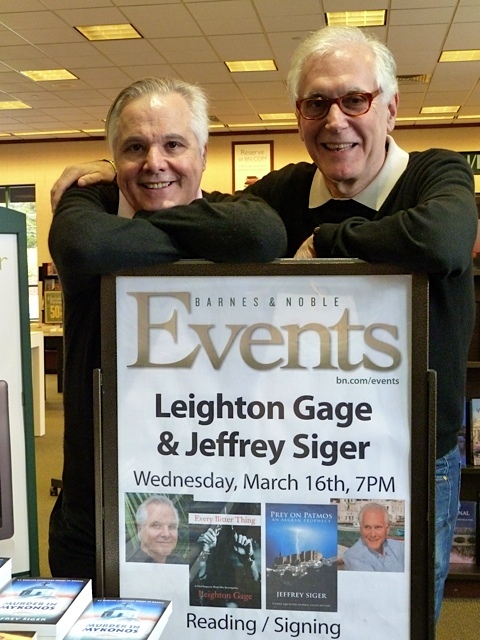 But my fondest memory of Leighton is the time we shared together at a joint book signing he’d arranged at a Barnes & Noble in Reston, Virginia. (The photo at the top of this post captured that memory.) We had such fun we vowed to take it on the road and call it “Silver Hairs on Tour.” I’m afraid that will have to wait. Leighton was a gentleman-leader, relentless in the pursuit of aiding his friends, a gifted author, articulate spokesman for his cherished Brazil, and loved by all lucky enough to know him. The world is greatly diminished by his passing and the mystery community mourns an irreplaceable mentoring friend. God rest your soul, dear brother. Once again you two bring tears to my eyes. I loved seeing Brazil through his eyes. That's another reason Leighton loved you, Lil. As do Tim and I.
I met Leighton through a discussion on Amazon that started being about mysteries and veered off into the need to find a way to promote new authors who did not have the public relations support afforded to authors who no longer need publicity to sell their books. (How's that for a run-on sentence?) I had been posting reviews on Amazon and Leighton suggested I try doing a blog as well. I figured if Leighton thought I could do it, I'd give it a try. Leighton made suggestions and out of that grew a correspondence that I will always treasure. We exchanged emails at least once a week and he became the best friend I never met. It isn't yet possible to think of him without crying because of his loss. Comments made since his death revealed that he carried on these email relationships with many people. I don't know how he had the time. Never once did I have the sense that these exchanges were perfunctory, that they were rattled off without thought and heart. My prayers are for his family and close friends. If I feel his loss so keenly, how devastated they must be. He was elegant and gracious in everything he did. Those who met him have referred to him as a big man. 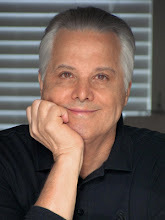 He was clearly big in talent, big in generosity, and big in his commitment to other writers. I am so grateful to have known him. Many times Leighton would write me about how to approach a subject and his frame of reference would begin. "So, what do you think Beth would think of this?" That's how genuinely he felt about you and respected your opinions. We have lost a great friend. Jeff, you flatter me. On today's edition of Salon, there is an essay by Sean Beaudoin entitle "Hell is self-promotion." In it he writes, "But since the collapse of publishing (or at least the explosion of dire, whiny articles about the collapse of publishing), publishers themselves no longer spend the requisite money to advertise the existence of all but a handful of titles." This was Leighton's concern as he thought about all the great books published each year that never got the attention of the readers. I think Mr. Beaudoin and Leighton would have enjoyed talking to each other. Leighton believed that one reader's enthusiasm for a book was the best possible publicity for an author. I think we, who admired the man and the writer, could honor him by writing reviews of books that grab our imaginations, that transport us to other places, and bring attention to books that could disappear now that Leighton isn't here to be cheerleader in chief. Thanks, Cara. A fine testimonial to the writer and the man. Thanks, Tim and Jeff. As I read your pieces, I was 'fondling' a rock that I recently picked up on a trip to the beach, small, gray, nondescript, but almost polished in its smoothness, worn by the relentless waves and sand. I won't go into great detail about all of the philosophical thoughts that have come to me while meditating on this little stone. But it makes me think of each of our lives, and how we're shaped by the persistent 'touch' of people and events throughout our lives and how we provide those touches to the people we encounter. Not having met Leighton myself, I'm never the less touched by reading of others' encounters with Leighton. You've put your finger on the intrinsic underlying value of this MIE experience: The creation of a "space" where literate thoughts from divergent venues get to touch so many in a free and respectful encounter. Though I must admit, Everett, we did have to bend the rules a bit for you on the respectful thing:). Where's Rodney Dangerfield when I need him? I am so happy that you all realize how special he was. I am sure he is touched, looking down from his place beside the biggest writer of all. Thank you, Eide. Yes, Leighton remains special to us all in so many ways for so many wonderful things, none more important than giving us the opportunity to meet and laugh with you. Jeff, you've captured everything about Leight so well it's hard for me to add to it. Your first couple of graphs particularly sum it up for the way I feel. And the tears are getting in my way as I write this. Leight and I go back a bit. We met at college, soon became close friends and roomed together for a couple of years. We had many common interests, the first of which was broadcasting. Did you know, among his many talents, he worked his way through school as chief engineer of a nearby small radio station? He was not an engineering student, he was in liberal arts, but he had the skill. After college we got together, following a brief hiatus, and bummed around Europe for two happy years, touring by bicycle. We went our separate ways with our separate careers after that, but kept in contact, especially after email became available. Then came some of the best times we had together, over the last 15 years or so, when I was able to visit him and his wonderful family in Florida. Like many good things, I thought it would last forever. It hasn't and I deeply grieve. Still, we did have 54 fantastic years with a load of larks. By the way, I remember that time in Reston, Jeff. I think Leight was in his element when he was doing his presentations, and you and he blended beautifully that night. The picture captures it. There is so much I will remember and celebrate about Leight as I move on. It was a privilege and ongoing pleasure to have known him. Tony, it's hard for me to think of anyone whose comment I appreciate more than yours. I know how much Leighton treasured your friendship and how our now notorious Reston appearance fit in so nicely with your travels together on an updated, abbreviated US version of your two wild and crazy guys post college romp across Europe. No, I didn't know Leight was a sound engineer, but he sure knew how to bring beautiful music into so many people's lives, including yours and mine. Yes, we were blessed to have known him. Thanks, Tony, and all the best.